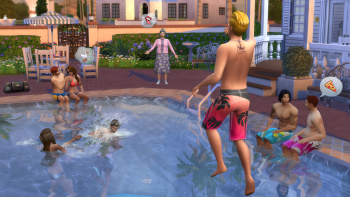 Pools and drowning return in The Sims 4 through a game update. The Sims 4 feature that people have been dying to dive into is finally going to be included in an update to the game available today. The update is available for free, just as EA previously said, and it will download upon logging into Origin and launching the game. After downloading the update, The Sims 4 players will be able to build pools, including diagonal pool building, and place pools on any level - that includes rooftops. Sims can go swimming or sit on the edges of the pool. Swimwear is naturally back as well, as is death by drowning - an old favorite. Sims who died may come back as angry ghosts. A blog post in June on the official The Sims site indicated pools and toddlers would not launch with The Sims 4 in September. Shortly after the news broke, EA stated it had to cut some features from launch because the team was focusing on other things. This update will also fixes performance issues, an issue where elderly female Sims thought they had one leg instead of two, levitating children when blowing out birthday candles, possessed grills, and many other bugs. The full list of fixes in the update are listed here in the patch notes. The Sims 4 launched September 2 in North America, September 4 in Europe and Australia, and September 5 in the UK.